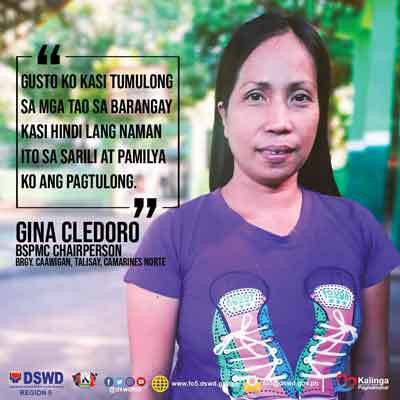 For Gina Cledoro, 40, Barangay Sub-Project Management Committee (BSPMC) chairperson, she must juggle her time as a mother and a volunteer. She would often bring her child when attending seminars of DSWD Kalahi-CIDSS. Cledoro shared that some volunteers would not attend meetings or seminars since they must work to earn a living. “Ayaw nila kasi iniisip nila paano na ang pamilya nila. Siyempre, ang pagseseminar ilang araw din iyon kaya ano na ang kakainin ng iba (Some members refuse to attend thinking about their families. Knowing a seminar runs for days, some prefer to work just to have food to eat),” she said. Cledoro recounted that her husband would often say that she wouldn’t get anything from being a volunteer and it will only waste her time. “Ako po bilang volunteer kahit nagagalit sa akin ang asawa ko, gusto ko kasi tumulong sa mga tao sa barangay kasi hindi lang naman ito sa sarili at pamilya ko ang pagtulong (Even though my husband would get mad at me, I as a volunteer, still want to help my barangay because helping is not just for myself and my family),” she explained. Cledoro also believes that knowledge is something to be shared. “Kahit ano man ang nalalaman ko, dapat malaman din nila (Anything I know should be shared to them),” Cledoro continued. Just like Cledoro, the barangay captain also shared other values he learned along the implementation of DSWD Kalahi-CIDSS. “Nag-vovolunteer sila na walang bayad pero nagtiyaga sila, kaya ito [productivity center] yung reward. At iyong reward na iyan, sila rin magtatatrabaho sabusiness (The community volunteers provided their service without pay yet, they’ve shown determination; thus, receiving their reward. With the center, they are also the workers for their livelihood business),” Villagracia imparted. Through volunteerism, the community has built a productivity center that will serve as another source of livelihood of many families.